The OECD released the latest data on broadband usage this week highlighting yet again that the high costs of Canadian wireless services have real world consequences when it comes to consumer data usage. Earlier this month, Canadian Wireless Telecommunications Association President Robert Ghiz told an industry conference: Consumption of mobile data - through all kinds of apps and every flavour of streaming content - continues to grow at an astounding rate in Canada. Mobile data traffic in our country increased by 41% between 2015 and 2016 alone. Yet the OECD comparative data tells a far different story. 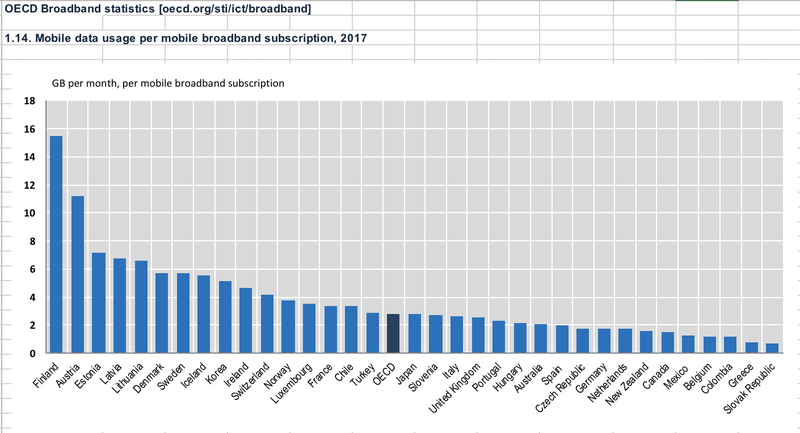 First, OECD data indicates that Canada is at the low end of countries when measured by mobile broadband subscriptions per 100 inhabitants, ranking well below the OECD average and ahead of only six other OECD countries.